!Action Pact! were an English punk rock band formed in Stanwell, England in 1981 (originally as The Bad Samaritans). It all started with the Big Bang. The Universe was created, gasses started to fuse, forming the planets, earth ... (er, you don’t have to go back quite THAT far, a recent history will do. Ed). Ok. It’s 1890. Rock ‘n Roll is 60 years away, … (better, but I think you can improve on this. Ed). 1979? (almost. Ed). It’s 1981 (Ta-daaa. Ed). Thatcherism is yet to grip the nation in a full-on headlock and half-choke it to death. 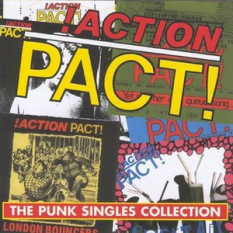 !Action Pact! rose from the ashes of the Bad Samaritans, with the aim of lightening the mood of a youth, depressed by unemployment, the rise in tribal violence, the Cold War and Duran Duran. The first line-up comprised George Cheex, Wild Planet, Dr Phibes and Joe Fungus, and their first recording, a split single with Dead Man's Shadow, featured "London Bouncers" and "All Purpose Action Footwear". 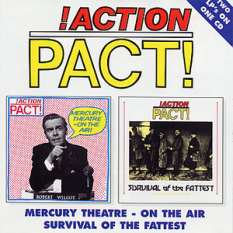 Regular airings on John Peel's BBC Radio 1 programme, some gigs and a hint of coverage in the music press led to a deal with Jungle Records subsidiary Fallout, and a second single, the mighty Suicide Bag EP – this was the first !Action Pact! release to feature three tracks, two ‘serious’ and one ‘throwaway’. By mid-1982, the band had recorded two John Peel sessions and was gaining in popularity. Joe then decided he had had enough. Grimly Fiendish was recruited via the music press and the band picked up where they left off. A new EP, People, was recorded just before Christmas, and the first LP, Mercury Theatre-On the Air!, just after. Gigs were played in support of both releases. However, like Joe, Dr Phibes decided to leave, not for him the ritual of being in a band, but he continued to provide incisive and witty lyrics for the group to use. With the album Top 5 in the Indie Charts, the band were invited to do a session for David ‘Kid’ Jensen on Radio 1. Phil Langham, the band’s producer, and bassist/singer with The Dark, stood in on bass, under the name of Elvin Pelvin. The session was re-recorded, along with a new version of "London Bouncers", for release as a 12” EP. In the summer 1983, Phil, whose position was only ever temporary, was replaced on bass by Thistles, the last change in personnel until the band split in 1986. The band continued to tour sporadically, even playing to 5,000 people at the Futurama Festival in Leeds, alongside New Model Army, The Smiths and Killing Joke. A new EP was recorded in the Autumn, A Question of Choice, featuring the seminal "Suss of the Swiss". The next six months saw the band writing and rehearsing new material, interspersed with occasional gigs. 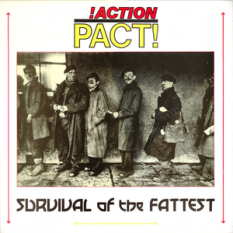 Their second LP, Survival of the Fattest, was released early Autumn 1984, forcing the band out on the road again, including, for the first time, Europe. 1985 came and went. "Yet Another Dole Q Song" was released, making the Indie Top 10. More gigs, one last single, "Cocktail Credibility", which became "Single of the Week" in Melody Maker, no less. Otherwise relatively quiet, with the band writing and rehearsing new material for their third LP. However, by early 1986, it was clear that the band’s popularity was dwindling, and the record company had no interest in putting out a third LP. With that, the rhythm section departed for pastures new, effectively ending the band. Sorry, guys! 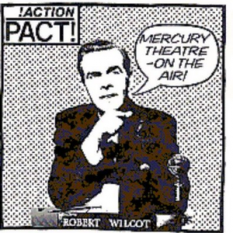 Mercury Theatre: On The Air!